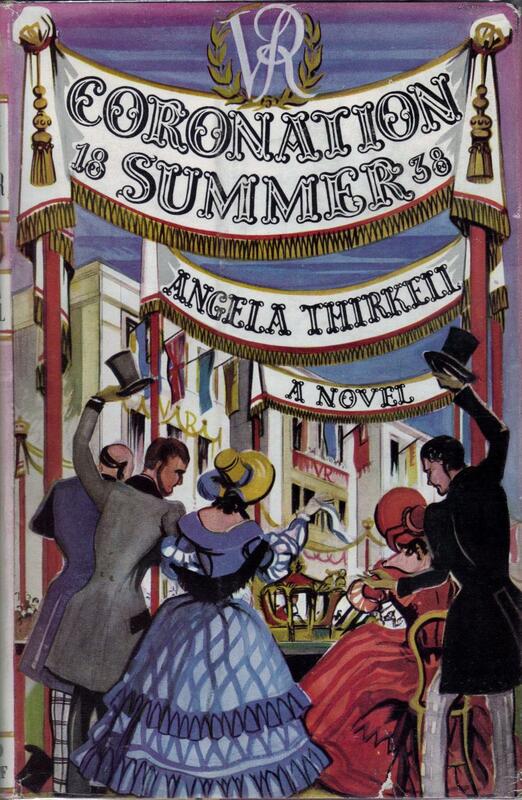 I don't think Angela Thirkell was ever really a bestseller but her books, it appears, sold steadily over the years, in a career that last from about 1930 to her death in 1961. 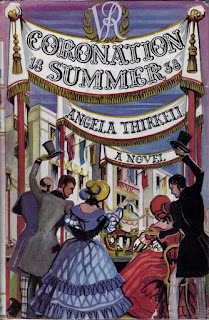 She still has a strong coterie of fans -- indeed, the Angela Thirkell Society will have a convention in Kansas City this year just the week before the World Science Fiction Convention. She was born in 1890, the daughter of John Mackail and Margaret Burne-Jones, thus Rudyard Kipling's first cousin once removed, and Edward Burne-Jones' granddaughter. J. M. Barrie was her godfather. Her brother Dennis was also a novelist. Angela Mackail married James McInnes in 1911, and had three children with him befor divorcing him. (He was bisexual, and an adulterer.) She married again in 1918, to George Thirkell, a Tasmanian man, and the couple moved to Australia. But Thirkell hated it there, and left Thirkell in 1929, taking her son Lance and returning to England. Perhaps because she need the money, she began to write (she had done some journalism in Australia), and her first novel appeared in 1931. Some 40 books followed until her death (the last completed by another hand). The great majority of her books were set, curiously, in Barsetshire, the fictional county invented by the 19th Century novelist Anthony Trollope. 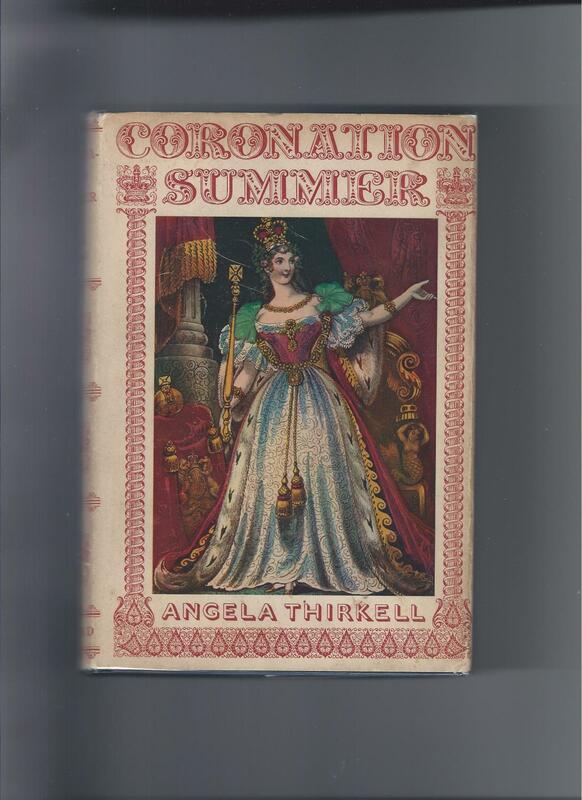 Thirkell's books were contemporary, imagining Barsetshire as it would have been in the '30s-'50s. Many of her books, especially the later ones, were fairly conventional romances in plot structure. But as far as I can tell, her virtues were never plot, but instead a cheerfully satirical view of her characters and their milieu, and a great ear for dialogue. Part of the book is sort of a travelogue and description of London life in 1838. Period illustrations are included: things like reprints of opera tickets. And there are numerous events: the Coronation, of course, but also a canoe race, a ceremony at Eton called Eton Montem, an opera, dress buying, and the occasional party. There's a plot, too, if a fairly thin one. The story is presented as Mrs. Fan Darnley, as of 1840, writing up her memories of her summer in London the year of the Coronation, 1838. It opens with her and her soon-to-be sister-in-law, Emily Dacre, opening a book intended for Fanny's husband Henry Darnley. The book is Ingoldsby's Legends, and they wonder if the author, Thomas Ingoldsby, is the same Tom Ingoldsby whom they met in London. (Ingoldsby's Legends is a real book, once quite famous, though there was no Tom Ingoldsby -- that was a pseudonym.) Fan decides to write about her and Emily's visit to London. In London they meet a couple of eligible men -- Mr. Vavasour, a rather pretentious author; and Henry (Hal) Darnley, a friend of Fan's brother Ned from his time at Cambridge. Hal and Ned are in London partly to prepare for a race. As we know from the beginning of the book that Fan's married name is Darnley, there's not a ton of suspense (not that there would have been -- in the way of romance novels it's pretty obvious from the start that Mr. Vavasour is not a suitable candidate). Meanwhile, Emily and Ned fall quickly in love. The two young women spend the next few weeks seeing what they can in London, while Fan's father, Mr. Harcourt, risks his family's solvency by gambling. Fan shows some interest in Mr. Vavasour, but really from the start she clearly prefers Hal Darnley. They meet a number of famous people, including the novelist Benjamin Disraeli (well, he's a politician too!) and the controversial poetess Caroline Norton, of who Fan cannot approve as she has left her husband. (This was a scandalous case in 1830s London, eventually leading, through Norton's efforts, to improvements in the rights of women in cases of divorce, especially as to custody of their children. Her husband was a bad person, abusive and financially reckless, so she was widely sympathized with.) Anyway, things come to a head at the end with Hal Darnley apparently convinced that Fan prefers Mr. Vavasour, and with Mr. Harcourt ruined (and Mrs. Harcourt, back home, on her deathbed). But all is resolved happily (largely because Hal Darnley is a very rich man). In reality, then, the plot is of minor interest, and the sort of travelogue aspect is, while somewhat interest, not really that fascinating. But the book is still great fun -- why? The dialogue, and the portrayal of the characters. It's quite funny throughout. Mr. Harcourt (Fan and Ned's father) is very amusing: a blowhard of sorts, generous to a fault while pretending to be close with his money, a reflexive and unthinking Tory who hates Frenchmen especially. Fan is a bit of a prig and thus is always disapproving of Emily, who is slightly more relaxed, and Fan's exasperation with Emily is delightfully portrayed. 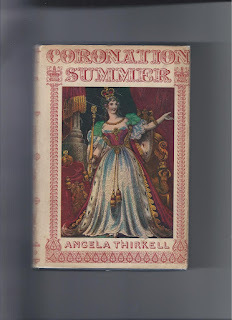 Coronation Summer is a short novel, and a slight one, but it's really rather delightful in sum. I'm not sure I'll get around to any of Thirkell's Barsetshire novels, but I'm quite sure I'd enjoy them if I tried them. Here's a very true Old Bestseller -- this novel was published in 1908, and was 8th on the Publishers' Weekly list of the top ten sellers of that year, and again 9th in 1909. And the author had the top sellers of 1896 (Tom Grogan) and 1898 (Caleb West). Tom Grogan seems particularly interesting -- about a woman whose husband dies, and who then dresses as a man and does his work in order to keep earning his paycheck. Francis Hopkinson Smith (1838-1915) was a true polymath. He was a renowned civil engineer (perhaps most famously building the foundation for the Statue of Liberty, and the Race Rock Lighthouse). He was a major artist, noted mostly for landscapes done in charcoal or watercolor. He was a descendant of Francis Hopkinson, one of the signers of the Declaration of Independence. And of course he was a prolific novelist, writer of multiple bestsellers, beginning with his first successful novel, Col. Carter of Cartersville (1891). He had a reputation as a chronicler of the Old South, but I should note that none of the other bestsellers I mention -- Tom Grogan, Caleb West (about the building of the Race Rock Lighthouse), nor Peter, are particularly about the South. Autobiographical elements did creep regularly into his novels -- as with Caleb West, as already noted. Also, The Fortunes of Oliver Horn deals with the artist life, and portrays versions of a number of Smith's artist colleagues, and a number of Smith's heroes (including the hero of Peter) are natives of Smith's own home state, Maryland. Peter was first published in 1908 by Charles Scribner's Sons. My edition is also from Scribner's, a 1913 reprint. There are four illustrations by A. I. Keller. The novel is subtitled: "A Novel of Which He is not the Hero". It opens in New York, with the narrator, or Scribe, called only the Major, coming to Peter Grayson's worksplace, a distinguished old bank, the Exeter. Peter is about 60 years old, a teller. He is a bachelor, and he has a maiden sister, Felicia. The time is late in the 19th Century. The first couple of chapters slowly introduce Peter and his morals -- his belief in honest work, his devotion to his modest job, and the respect he is held in by numerous people. Peter and the narrator make their way to Peter's apartment, where they find an invitation to a party given by the architect Holker Morris for his employees. (It has been suggested that the character Morris was based on the famous architect Stanford White, a friend of Smith's, who had been murdered in 1906 by the husband of Evelyn Nesbit, an actress and one of the Gibson Girl models, who had apparently been seduced by White while only 14 or 16 (her birthdate is in question). I should add that the portrayal of Holker Morris in Peter gives no suggestion of White's scandalous history.) At Morris' party, he awards a prize to Garry Minott, a young star at the firm. Peter, however, is more impressed with Garry Minott's friend, John Breen, and he decides to take an interest in him. Breen is an orphan, who has been taken in by his uncle, Arthur Breen. John (or "Jack") is working in his uncle's financial firm, but he has become concerned over what he thinks are potentially shady dealings -- nothing illegal, but immoral. The last straw comes when an acquaintance is ruined due to Arthur's maneuverings. Jack is also slightly importuned by Arthur's stepdaughter, Corinne, a vaguely pretty but spoiled girl who seems to regard Jack as her rightful property. 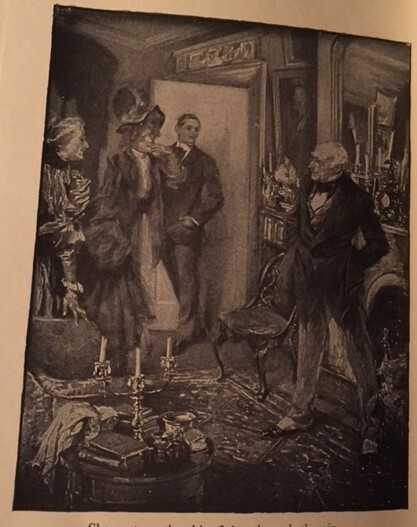 And as Jack grows closer to Peter Grayson, he is offended that Corinne -- and Garry Minott, who has begun to see Corinne socially -- seem unimpressed, to the point of rudeness, with the old man. With some subtle prompting by Peter, Jack quits his uncle's establishment, leaves his house, and looks for a job -- eventually finding one with the engineer Henry MacFarlane -- who, as it happens, has a beautiful daughter, Ruth, whom Jack had met and been entranced by at a party given by Peter and his sister Felicia. The story begins to jump forward, with Jack Breen beginning to do good work for Henry MacFarlane, and beginning to get closer to Ruth. Peter Grayson stays in contact, and so does his sometimes meddling sister Felicia. Ruth and Jack are clearly in love, but Jack's pride stands in the way of marriage. Then a dramatic disaster threatens Henry MacFarlane's life and livelihood, and Jack is instrumental in saving the day. Meanwhile, Garry Minott has married Corinne and started his own business. This is by no means a great novel, or even a very good one, but it's not a bad read. There is one point to make -- this book was published 3 years after Edith Wharton's great novel The House of Mirth. 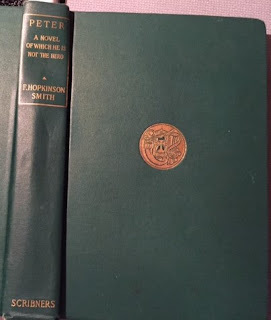 Wharton's novel is almost infinitely better -- but it is noticeably accepting of its period's anti-Semitism, and Smith's novel is quite pointedly critical of that attitude. There is another point of connection with The House of Mirth -- each novel features a slightly ambiguous suicide, by the same means (chloral hydrate). Peter Grayson, as noted in the subtitle, is not officially the "hero" of Peter, but he is the linchpin: a highly moral character, dismissive in particular of those who lust after money. He is a good friend to Isaac Cohen, even as his whole set (including his beloved sister Felicia) automatically reject him due to his religion. Peter is certainly an implausibly saintly character, but he's interesting and someone we like. Ruth and Jack are also implausibly wonderful people, but that's the way this sort of novel goes. There are noticeable details that reflect Smith's own life. Henry MacFarlane, the engineer, surely resembles that aspect of Smith to a degree. There is a short section discussing artists that seems to comment on Smith's views of art, and his place in the art world. None of this comes off as tendentious -- rather, Smith's clear knowledge of both milieus gives the book a certain believability. Once again, this is a novel that seems quite plausibly a bestseller of its time -- but not a novel that especially demands our attention over a century later. Looking for a book to cover this week, and not wanting to dip again into my trove of Ace Double reviews, and not quite finished with my latest Old Bestseller, I figured I'd cover a couple of lovely children's fantasies by the great George MacDonald. George MacDonald (1824-1905) was a Scottish clergyman of the latter part of the 19th Century, rather Universalist in his views, a significant influence on C. S. Lewis (to the extent that Lewis made him a character in The Great Divorce), and the author of several excellent children's fantasies, and some fine work for adults as well. My favorite of his books has long been At the Back of the North Wind. Other fine children's work includes The Princess and the Goblin and The Princess and Curdie (the first of which was made into a (so-so) animated movies a few years ago), and Lilith is a fine adult novel. Phantastes, which I have not read, also has a reputation as a good adult fantasy. As with Lewis, most of his work is at least partly Christian allegory, or at any rate heavily imbued with Christian themes, though MacDonald could be much stranger than Lewis. In the late 1960s, Maurice Sendak illustrated a couple of shorter MacDonald children's stories (about 10,000 words apiece). These were The Light Princess and The Golden Key. Thus these aren't really forgotten: indeed MacDonald has settled into a fairly established place in the canon of 19th Century religious fantasists. The Light Princess is very light-hearted and funny, while The Golden Key is a mystical and lovely fairy tale. The Golden Key is the story of two children, a boy and a girl, who live (not together) on the border of Fairyland. The boy has been told that at the end of the rainbow he can find a golden key -- it is not to be sold, and no one knows what door it may open, but it will surely lead somewhere wonderful. One day he sees a rainbow, and decides to follow it into Fairyland, where it seems the end of it might be -- and there he finds the golden key. Meantime, the girl, much mistreated, wanders into the forest of Fairyland, following a strange owl-like flying fish. Soon she meets a beautiful, ageless, woman, and she learns that she and the boy must journey together, looking for the keyhole into which the golden key will fit. Their journey is long (though the story is short), and quite wonderful. They meet some strange and wise old men, and encounter many beautiful and curious sights. At last, of course, they find the doorway with the keyhole. The ending is unexpected and quite moving and beautiful. It is tempting to try to analyze this story -- is it an allegory of marriage? or the story of a joint journey to salvation? Perhaps, though, as W. H. Auden suggests in an essay published as an afterword to this edition, it is best to simply let yourself be absorbed by the story, to enjoy its lovely and haunting images. The Light Princess is the tale of a princess who is cursed by a mean, jealous, witch so that she has no gravity. The book is full of puns, so MacDonald makes much both of her weightlessness, and the lack of gravity in her character. Naturally her parents are upset and try to have her cured, but to no avail (although the efforts of a couple of Chinese philosophers to provide a cure are rendered amusingly). However the Princess is quite happy with her "light" state (of course it is in her nature to be always happy). In the way of things, a Prince appears, and falls in love with the Princess. Then the witch realizes that her curse has failed to make the Princess unhappy, so she takes further steps, which are thwarted by the selfless behavior of the Prince, and which result in the Princess recovering her gravity: not an unmixed blessing, but one which her new maturity allows her to realize is best in the long run. This is a delightful story, told with just the right mixture of whimsy and mildly serious moral comment. The characters are lightly and accurately drawn (the Princess` parents and the Chinese philosophers in particular, are delightful), and the story is predictable but still quite imaginative, with a number of nice touches to do with the Princess` weightlessness. Over at Black Gate I have made a post about the 2016 Hugo Final Ballot, and its problems. This is all fairly familiar ground, mind you. I'm planning another post sometime in the next few months which will review the ballot category by category, with my thoughts on how I'll vote, but that'll have to wait until I read what I haven't read yet. Both authors of this Ace Double are fairly significant -- Van Vogt of course is a legend, and an SFWA Grand Master. Long is less prominent, but he did win a World Fantasy Award for Lifetime Achievement, and he has -- or had -- a significant reputation as a Horror writer, and a disciple of H. P. Lovecraft. Both were also very long-lived. A. E. Van Vogt was born in 1912 in Canada, and died in 2000. He worked for the Canadian Ministry of Defence, doing some writing on the side, beginning with true confessions stories, and turning to SF in 1938, inspired by John Campbell's classic "Who Goes There?". His first sale, to Campbell at Astounding, was "Black Destroyer", still considered a classic. He made a huge splash in 1940 with the Astounding serial Slan, and another splash with "The Weapon Shop" (1942), which was fixed up into a novel, The Weapon Shops of Isher. (The term "fix-up" was, I believe, a Van Vogt coinage.) His most famous novel is probably still The World of Null-A (serialized in Astounding in 1945). He became a full-time writer in the early '40s, and moved to California in 1944. He was an early adopter of L. Ron Hubbard's Dianetics (later Scientology), though he apparently left the movement around 1961. There is no denying Van Vogt's immense importance and influence in the field of SF, and I certainly don't dispute that he deserved the Grand Master award. But I confess I've never much liked his work. By and large I agree with the points Damon Knight made in his famous essay on The World of Null-A. I've generally found Van Vogt's work illogical, not very well-written, downright slapdash on occasion. But a lot of people I truly respect really love his work, so I admit without reservation that I am missing something important. Sometimes that's the way it is. I have to say I was pleasantly surprised by the book: I quite enjoyed it. 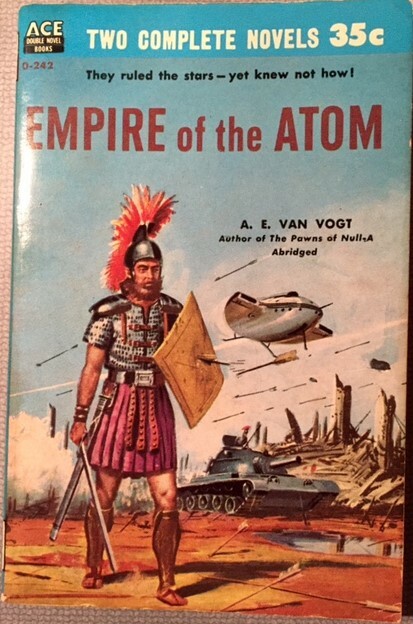 One reason is that the plot is more controlled, more logical, than in other Van Vogt books, only veering off in a Van Vogtian direction right at the end. There's a reason for that -- I realized immediately that his had to be a retelling of some portion of Imperial Roman history, but my knowledge of that history was not sufficient for me to recognize the exact correspondences. But Wikipedia helped immediately -- the story is based on the life of the Emperor Claudius, most specifically as portrayed by Robert Graves in I, Claudius. This anchoring in actual historical events, I feel, kept Van Vogt on course, as it were. It is set some 10,000 years in the future, after humans have colonized the planets of the Solar System, and then been reduced to barbarism on each of these worlds. A city-state, Linn, arose, and in the recent past it conquered the world and began to try to annex the barbarians on Venus, Mars, and even outer satellites such as Europa. The ruler, or Lord Leader, is a vigorous man but getting older. A new child is born to his scheming second wife, Lydia. (These are, of course, analogues to Augustus and Livia.) The new baby, named Clane, turns out to be a mutant -- Lydia was accidentally exposed to radiation -- this society uses radioactive metals (and worships the "Atom Gods") but has no idea how they work. As a mutant Clane should be killed. However, a leading Temple Scientist wants to raise him and show that mutants, if treated properly, have the same potential as anyone. So Clane is raised, somewhat isolated, and becomes an unusual but very intelligent young man. The succeeding episodes show Clane learning how to function amidst his scheming relatives, the worst of whom is Lydia, whose prime desire is to place her son by a previous marriage, Lord Tews, on the throne. Clane has no wish to rule, but he does wish Linn to do well, and he does have relative favorites among his relatives, and so he helps one of his Uncles to win a great triumph on Mars, only to have the maneuvering of Livia and Lord Tews mess things up. The dueling continues, as a rebellion on Venus is also crushed, as Clane makes some significant discoveries, and as Tews finally achieves his goals, only to be threatened by an unexpected barbarian incursion from Europa -- a crisis that at last forces Clane to the forefront. Here at the denouement the book finally takes its Van Vogtian turn, but I actually found that aspect kind of cool. There is a sequel, The Wizard of Linn, serialized in Astounding in 1950. Frank Belknap Long (1901-1994) began publishing in 1920 and his 1921 story "The Eye Above the Mantel" attracted Lovecraft's attention. He published quite a lot of horror-tinged fiction in the next couple of decades, contributing to Weird Tales from its first year (1923). His most famous story might be "The Hounds of Tindalos". He also wrote a fair amount of SF, and he wrote in several other genres (including comics, some Ellery Queen stories, a Man From Uncle story, and Gothics). 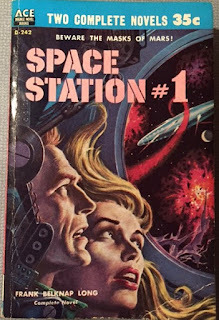 I first encountered Long with the Doubleday collection The Early Long, from the mid-'70s, part of a number of books that followed Isaac Asimov's The Early Asimov, in featuring early stories by well-known SF writers along with extensive material about the early careers of these writers. Even then I thought Long a curious choice for such an anthology, and I admit I've felt that way more and more as time goes by -- I've been very unimpressed by everything I've read from him. But I must admit that his reputation in the Horror field is actually pretty good -- I'm not really a Horror reader, so I must defer to those who really love that genre, and especially those who love Lovecraft. The most interesting SF story I've read by Long is "Lake of Fire" (Planet Stories, May 1951), not because it's all that good, but because it is a very direct prefiguring of Roger Zelazny's "A Rose for Ecclesiastes". For several chapters I found this quite entertaining, but somewhere along the way it went wildly off the rails. It devolves into a silly and implausible (but of course!) battle for the soul of Mars, as Corriston must convince the Martians that neither the oppressor Stephen Ramsey nor the thug they have hired to oppose him are worth respecting ... only, it turns out, Ramsey sort of his (if mainly for having a wonderful daughter) ... And Corriston proves his worth by trekking across Mars and beating up a guy and etc. etc. It really reads like Long started writing and every so often lost his way and just hared off in a new direction until he had written a novel's worth of words and then resolved things. The hero gets the girl, the villain(s) are vanquished, and, oh, by the way, at the last second he introduces Martian lampreys just because he needed to extend things a few thousand words more. Oh well.